The Rock Krawler Wrangler JK 3.5" X Factor Mid Arm System is the ultimate suspension system for JK owners looking to run up to a 35" tall tire! 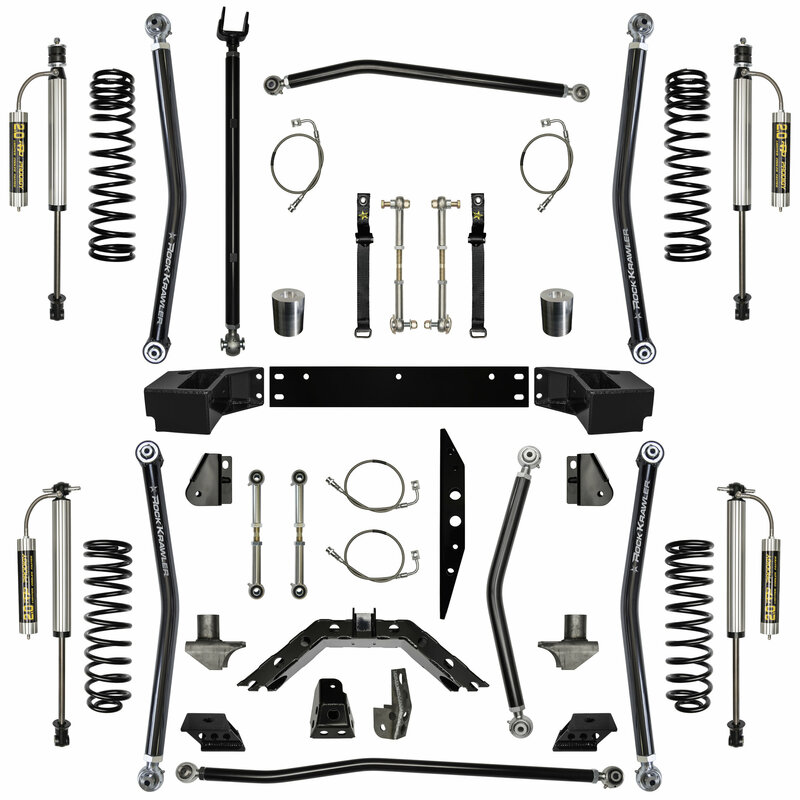 Each and every part of the factory suspension is either upgraded or replaced. The steering geometry has been engineered to provide you with stock on highway handling characteristics. What makes this system special is what it can do for you when the pavement ends! The 3.5" X Factor System off-road has all the bells and whistles to assure you of a great adventure. You get high clearance - high misalignment lower control arms front and rear, high misalignment upper adjustable control arms front and rear, front sway bar disconnects, and long travel stainless steel brake lines to name a few. Even the small details have not been over looked. The rear axle on the 3.5" X Factor Mid Arm System is moved back 1" to allow for greater clearance between the tire and the factory rock slider for all you JK owners with the factory Rubicon Package. This system is completely upgradeable to any other Rock Krawler Wrangler JK System and comes with our exclusive Abuse Proof Lifetime Warranty on all hard parts!